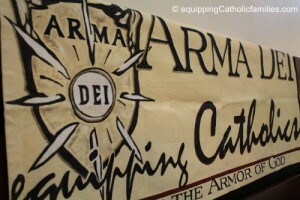 Another Classic Game…converted to be Catholic! HeadBandz! 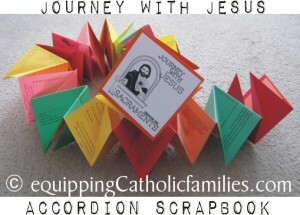 As many of you know, we’ve been scrambling to print the Super Saints cards in time for the World Meeting of Families. Our FlowerFunding campaign ends on Monday! 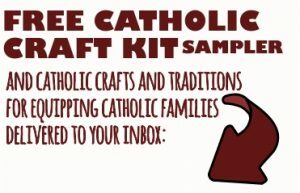 We have already released the Super Saints Craft Kit for those who just couldn’t wait to play with these unique quizzing cards and we’ve already had a number of awesome Catholic families tell us about how much fun they’ve been having, playing with these cards! 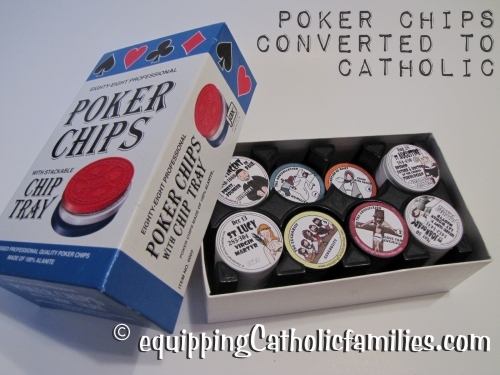 Years ago, I made a Catholic craft out of some poker chips, a plastic picture frame and double-sided suction cups. We called it Plunk! 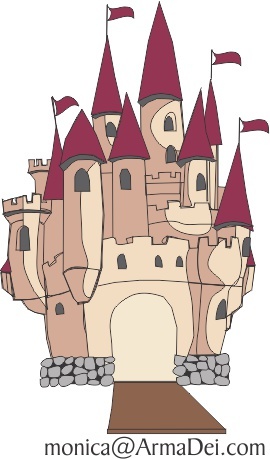 with the Saints and posted a tutorial to make a Plunk! board. Since then, our in-house artist (daughter) Kelly started drawing the Saints…and then the Mysteries of the Rosary and the Stations of the Cross. We’ve released a number of Cathletics Craft Kits with all kinds of templates to customize board game pieces, cake topper decorations…and we’ve finally got them ready for poker chips! Now, we keep coming up with new ways to use them! A little mod podge goes a long way! 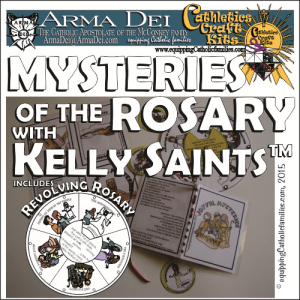 The Kelly Saints Stamps Craft Kit already includes a number of different templates of the Kelly Saints illustrations and bios, formatted to fit various game pieces, activities and crafts! The 1.5″ templates are a perfect fit for poker chips…but here are 30 ways to use the kit! 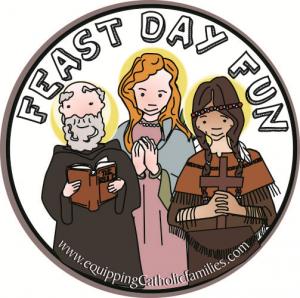 read more...for Equipping Catholic Families! NEW Cathletics Craft Kit released! 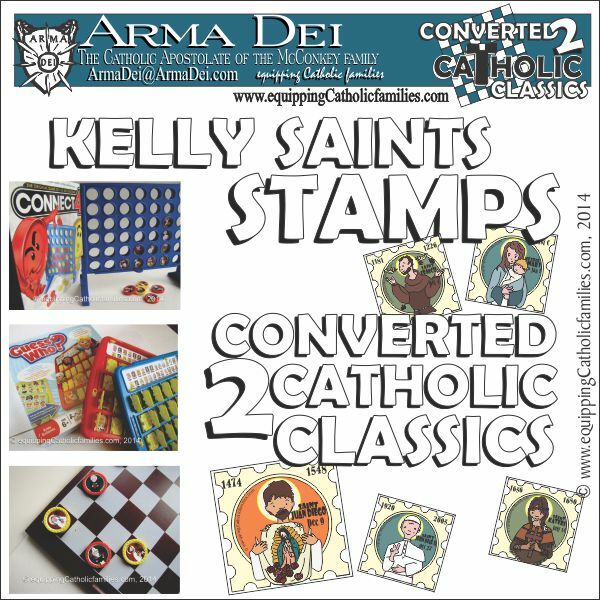 Convert your favorite boardgames to be CATHOLIC with the Kelly Saints Stamps Converted 2 Catholic Classics Craft Kit! 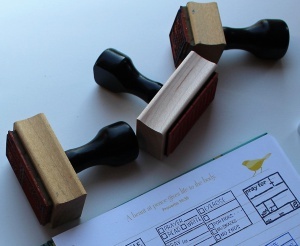 I’m sure I’ll be posting more detail about the over 15 ways to use this kit…but for now I’ll give you 7 Quick Peeks! doll makeovers of some on-clearance TY dolls! 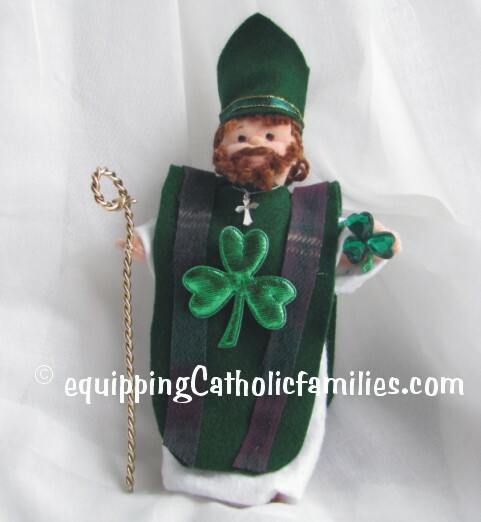 We even made a Jesus TY doll…and we have plans for him for an Easter activity coming up! Year of Faith Tower Tumble: convert your family game so that kids learn Catechism while they play this classic game! Things to do with Tiny Saints! Use these awesome Saint charms as zipper pulls, wine glass charms and board game pieces! 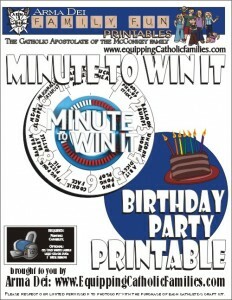 Cool games and crafts that have been converted 2 Catholic! Please join in! Classic Games: Converted 2 Catholic! 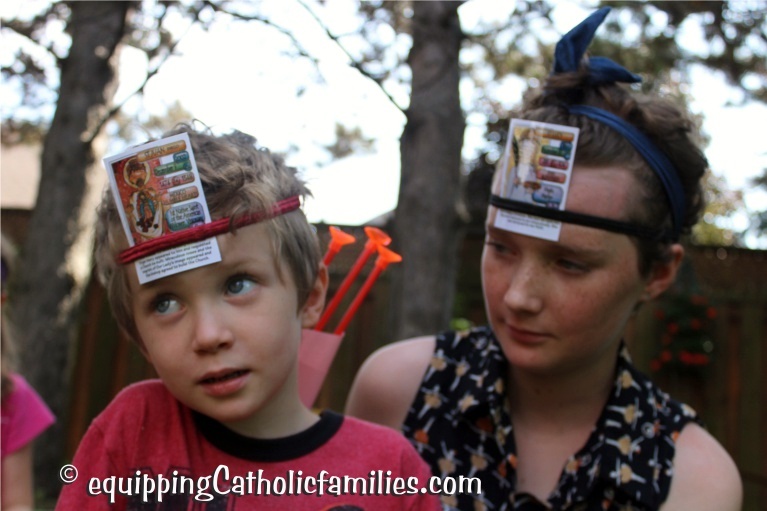 One of my favorite ways to integrate our Catholic Faith into regular family life is to find activities and games that our kids like to do anyway…and infuse Catholic Catechism and Saints into them. 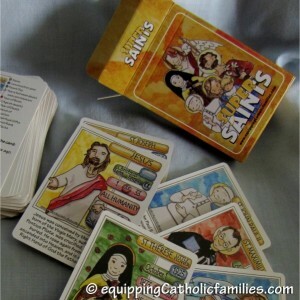 So far, we have showcased the Saints in Guess Who?, used Catechism facts to add meaning to coveted card combinations in=&1=& and used our Painted Saints as player pieces in =&2=&and =&3=&Our latest awesome favorite game…converted to Catholic with Saints… is=&4=& We have made =&5=& for the =&6=& like the =&7=& read more...for Equipping Catholic Families! Snakes & Ladders: Converted to Catholic! I am a wife, Mom of 5+ kids, a designer, an architecture school survivor, an author and a crafter and I think it’s cool to be Catholic! 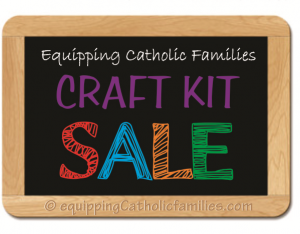 Check out the Arma Dei Shoppe for solid Catholic, fun teaching tools and gifts to celebrate and teach the Catholic Faith and subscribe to Equipping Catholic Families for family-building and Faith-centred crafts! 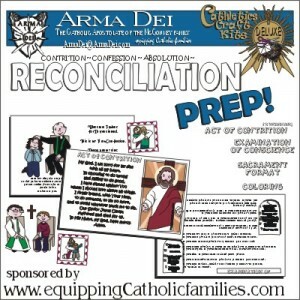 read more...for Equipping Catholic Families! We are the Church! 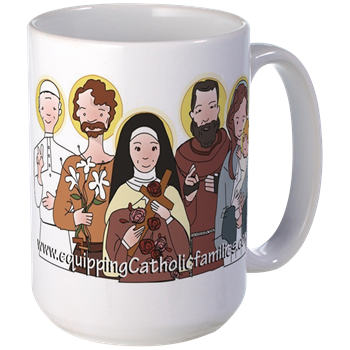 We identify those who have gone before us, both relatives and well-known Saints as the Church Triumphant (in Heaven) and we are the Militant (pilgrims on Earth). 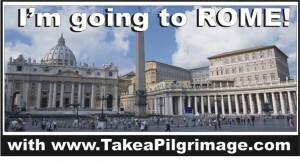 (CCC954) Recognizing that even the Saints had their setbacks and struggles, we too are on our Journey to Heaven. Imagine the board game of Trouble as that Journey…walking side by side with our heroes, the Saints! 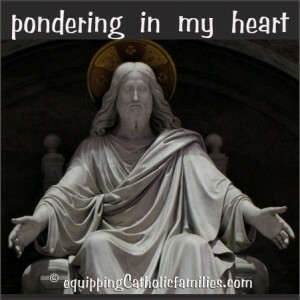 Blessed by intercession with the saints, we Catholics can walk the walk, in the company of the Saints! Painted wooden dolls come in handy for the most common of board games! Why not allow ourselves to build our Dream Team of Saints for our playing pieces. Conveniently, I have painted both members of our immediate family, and some of our favorite Saints. See Painted Peg People . 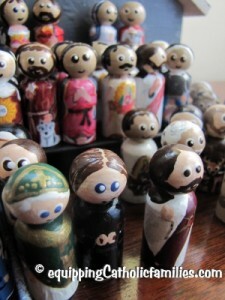 I think that the painted wooden dolls lend themselves perfectly to how we can learn from the Saints, seek their intercession and foster the desire to grow in holiness! Spiderman is cool and so is Superman, but aren’t the Saints our ultimate heroes? So excited to convert 2 Catholic…CHECKERS! 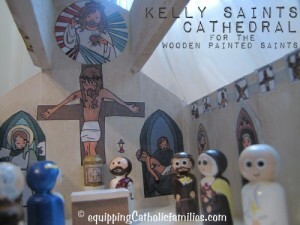 With my newly painted wooden peg dolls, the kids can customize their team of family members and favorite patron saints!